Port of Spain (Agenzia Fides) - "Every murder is a crucifixion of the Lord. Every time we let a homeless person die on the road, this is a crucifixion of the Lord. Whenever someone dies in our hospitals due to poor medical care is a crucifixion of the Lord. It is a crucifixion of the Lord whenever there is corruption in the government, and we take part in it". 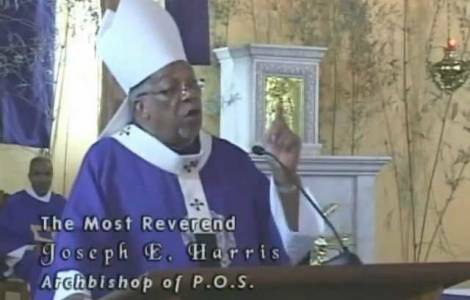 These are the harsh words of the Archbishop of Port of Spain, His Exc. Mgr. Joseph Harris C.S.Sp. during the celebration of Palm Sunday, March 20, which he presided in the church of Our Lady of Perpetual Help in San Fernando. The Archbishop said: "Every time you make a grave sin, you crucify the Lord once again".